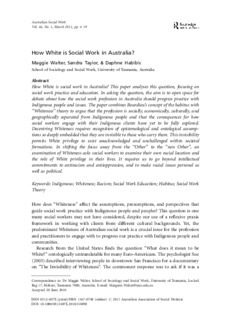 eCite - How White is Social Work in Australia? How White is Social Work in Australia? Copyright 2011 Australian Association of Social Workers. How White is social work in Australia? This paper analyses this question, focusing on social work practice and education. In asking the question, the aim is to open space for debate about how the social work profession in Australia should progress practice with Indigenous people and issues. The paper combines Bourdieu’s concept of the habitus with ‘‘Whiteness’’ theory to argue that the profession is socially, economically, culturally, and geographically separated from Indigenous people and that the consequences for how social workers engage with their Indigenous clients have yet to be fully explored. Decentring Whiteness requires recognition of epistemological and ontological assumptions so deeply embedded that they are invisible to those who carry them. This invisibility permits White privilege to exist unacknowledged and unchallenged within societal formations. In shifting the focus away from the ‘‘Other’’ to the ‘‘non Other’’, an examination of Whiteness asks social workers to examine their own racial location and the role of White privilege in their lives. It requires us to go beyond intellectual commitments to antiracism and antioppression, and to make racial issues personal as well as political.